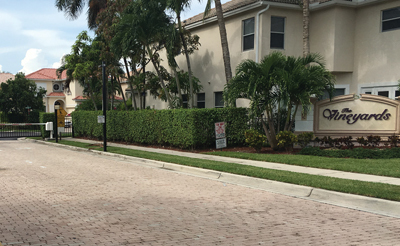 Gated communities are often tasked with creating the first line of defense in protecting assets within a community. There are a handful of options for controlling entry, which can include live guards, telephone entry boxes, virtual guards, or a combination of these options. 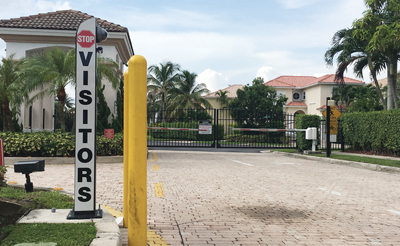 Kirk Russell, a board member at The Vineyards in Boca Raton, went through the process of trying to better secure his gated community. Security is an event-driven business, and after repeated gate damage at the Vineyards, Russell thought there had to be something out there that could help. The association had previously installed cameras to view the entrance that was protected by a telephone entry box. The came-ras did little to capture data needed to go after those causing the damage to the gates. In many cases, gate damage occurs because of tailgating into a property or because the entry system doesn’t work properly and visitors or residents become impatient trying to gain access to the community. 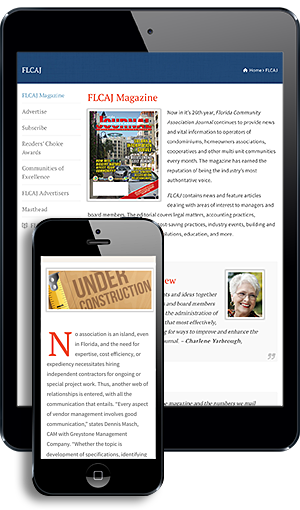 This can lead to expensive repairs for community associations that are often absorbed and not passed on to those causing the damage. The board members at The Vineyards found that their outdated telephone entry system and poorly performing cameras were not enough to secure their small community and began to explore the other options available to control access to communities. The board first began exploring the possibility of live guards. This was appealing to their community’s affluent members, but the costs to this 68-home community would be in excess of $150,000 per year for the services. Plus, they were not equipped with an ADA-compliant guard house, so the community would need to make extensive capital improvements to their property in order to accommodate this type of service. The monthly services alone would run in excess of $175 per home per month. The board also did not want to take on the liability of having a guard on site and the responsibility of staffing that guard 24/7. They were concerned with the possibility of confrontations with the guard and the fact that the guard would not be under constant supervision. This could leave a gap in their security. During their research, a resident mentioned Envera Systems to the board. The board began to explore the options provided by Envera, which included the Virtual Gate Guard product and access control solutions. The solutions were interesting because they used technology to grant access and stored a record of each entry to the community, which could provide more insight regarding those entering. The board members also discussed options with Envera to help deter the gate damage that was rampant at their community. Ultimately, The Vineyards community selected three solutions to protect their community, which were much more cost effective than traditional security guards and also more secure than their previous telephone entry and CCTV solutions. Those solutions were the Virtual Gate Guard for their visitor entry; vehicle access control for resident entry; and Active Video Surveillance, or what Russell refers to as “the voice of god,” for their pool. The community was actually able to protect their pool and entry gates for a fraction of what it would have cost to use live guards for just their entrance. The community also worked to add gate strike sensors and LED arms to their existing barrier arms to make the arms more visible at night and also provide notifications in the event that the barrier arms were hit. By choosing these solutions, the community was able to solve more than just gate damage issues. They are now able to control the number of credentials issued to residents for quick access through the resident entry lane and pull metrics and reports on entry through the resident lane. They have robust reporting on visitors allowed into the community. While gate damage has not been completely eliminated, the community is now able to obtain owner information with the Virtual Gate Guard system, in the event that the gates are hit. This allows the community to request that the vehicle owner reimburse the HOA for the damage caused to the gates instead of the HOA having to use their own money for the damage. The new systems have been operational at The Vineyards since the early fall of 2014, when the implementation team started registering homeowners and approved tenants for the access system and Virtual Gate Guard visitor registration platform, MyEnvera. Since going live, the system has saved the community thousands of dollars in gate repairs and really given the board the control they need to keep residents secure and protect property values. Community associations should evaluate professional options to help secure, monitor, and manage community assets. Key factors when evaluating security providers should include how a comp-any trains and employs guards (remote or live), what type of licensing the guards have, and what backup solutions a company employs in the event of inclement weather. Something else to consider when changing community security is whether or not the community can take on the costs associated with the type of security being considered. With new emerging technologies, communities should also research the best options to protect their assets. Crystal Clark has been working at Envera Systems since 2008. As Marketing Manager, she works closely with sales in providing best in class service to the communities that Envera works with. Envera Systems specializes in security technology systems combined with remote guards to replace or enhance guards at communities. For more information on Envera Systems, contact (855) 380-1274 or www.EnveraSystems.com.